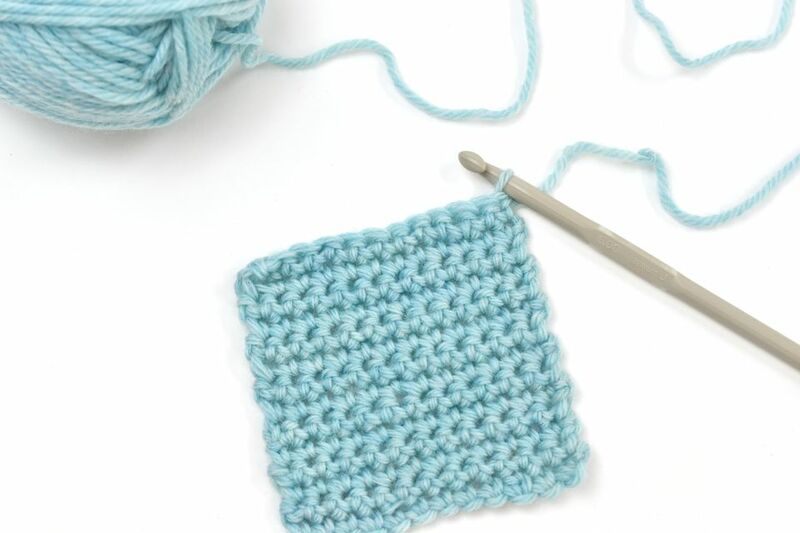 Single Crochet Stitch - What Is It, and Why Do You Need It? If you want to learn how to crochet, single crochet is one of the most important stitches you need to know. A majority of crochet patterns and projects incorporate single crochet stitches. Single crochet (referred to as double crochet in British crochet patterns) is one of the easiest stitches to master. Once you've learned the single crochet stitch, there are infinite possible ways to use it. You can work it in rows, in rounds or spirals, as edging, in different parts of the stitch for different effects and combined with other stitches in countless variations. After you form the foundation chain of stitches, insert the hook through the first chain. For the second row and beyond, insert your hook into the single crochet stitch directly below it in the row. Slide the hook under both loops on the top of the chain. Some patterns have you work through only one of the loops, which creates a different look–you can see samples at the end of this tutorial. When in doubt, go through both loops. With the crochet hook in place, prepare to draw up a loop. Wrap the yarn over your crochet hook, and grab it with the hook. When you've practiced these steps to the point that they are automatic, you might find that you get to the point when there isn't a gap between the first and the second steps. Your hook will grab the yarn just as soon as you insert it into the stitch. Pull or "draw" the hook and working yarn through the loops. You should now have two stitches or "loops" on your hook. Wrap the yarn around your crochet hook again, and hook the yarn. Draw the hook and yarn through both of the loops on the hook. This completes the single crochet stitch. One loop remains on your crochet hook. This loop is the starting point for your next stitch. You can repeat this sequence of steps as many times as needed to create additional single crochet stitches across the row (or round). Tip: If you are working your crochet in rows, the first row can be a challenge, especially for beginners. Many beginning crocheters have difficulty holding the work; at the beginning, there isn't much there to hold onto. If you have trouble working your first row of single crochet stitch, ask an experienced crocheter to work the first several rows for you. Then you can continue crocheting on the same piece. After the first few rows are complete, you'll find it easier to hold the work. After working enough rows to master the single crochet stitch, you'll have a much easier time working those tricky first rows in future projects. Want a different look with the same stitch? By inserting your hook through only one loop, the stitch takes on a new appearance. Try these variations! Insert the hook through both loops of the stitch (top left). That's the standard single crochet stitch. When people reference "single crochet" without any other description, this is what they mean. Insert the hook into the front loop only (FLO) of the stitch (top right). This variation creates a more open style of single crochet. Insert the hook into the back loop only (BLO) of the stitch (bottom left). This creates a variation with a ribbed appearance. It's also slightly stretchier as a completed fabric. Insert the hook through alternating loops (FLO, BLO, FLO, BLO, etc.) (bottom right). This creates a highly textured crochet fabric. No matter which place you choose to insert your crochet hook, follow the same steps for completing the single crochet. All of these different ways of working single crochet create a dense, thick fabric that is great for items that you want to be closed (instead of lacy). Washcloths, thick blankets, and winter scarves all work well in single crochet stitch. Once you learn how to single crochet, you can make all different kinds of things. Single crochet is the primary stitch used in amigurumi, for example. And it is used throughout all other types of projects as well.